They say (whoever “they” are) that you should enjoy the journey and not race to the destination. And, when you read Barry Jonsberg’s The Categorical Universe of Candice Phee, you just may be a believer. You would think that a book that follows the letters of the alphabet would be pedantic and forced. But, The Categorical Universe of Candice Phee cannot be categorized as contrived. It follows the story of twelve-year-old Candice Phee, and is hilarious, honest and touching. Candice Phee is a smart girl who lives in Albright, Queensland, a small town forty-one-and-a-half kilometers from Brisbane. Candice Phee thinks (actually knows) that she’s a bit weird but, she’s okay with it. She’s kinda average height, has blue eyes and freckles. She used to have a sister, but that is now in the past, and she doesn’t like computers or music (things most twelve-year-olds like, she admits). She doesn’t have many friends, apart from Douglas Benson from another dimension. Candice Phee’s immediate world consists of Dad, Mom, Rich Uncle Brian, and a pen-pal in New York called Denille (who doesn’t really write back to her). Her dad and Rich Uncle Brian are no longer on speaking terms. The coarse details of this aren’t clear to Candice and it seems that everyone is trying to keep her in the dark. There sure is a lot of “chaos” in her life, and you’ll have to read the chapter “C is for Chaos” to learn more about his aspect of Candice’s life. Did you know that “aardvark” is the first proper word in the dictionary? It’s the reason she called her fish Earth-Pig. She loves to read books by Charles Dickens because she thinks he has taken many of the trickiest words from the dictionary and put them in interesting orders. How clever and admirable! The book is absolutely delightful. Written for children ages 10 and up, I can add myself to that “up” category. It such a wonderful trip, the writing beautifully spliced together giving you the full picture of Candice Phee’s life. Who knew that getting from A to Z could be so entertaining? 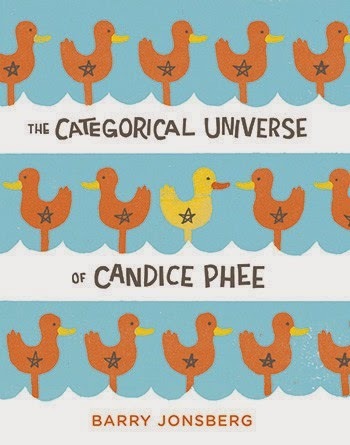 The Categorical Universe of Candice Phee is published by Chronicle Books, and distributed in Canada by Raincoast Books.